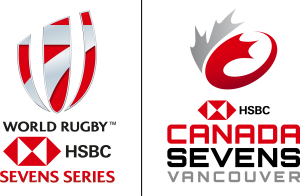 What will the HSBC Canada Sevens tournament schedule look like? The HSBC Canada Sevens tournament will feature 45 games played over two days. Rugby sevens matches feature two 7-minute halves of play with a 2-minute halftime. Doors are scheduled to open 60 minutes before the first match. The final match schedule will be set closer after Las Vegas Sevens on Monday March 4th. Teams will be divided into four pools consisting of four teams the week prior to the event, following the previous Series stop in Las Vegas. The tournament features 16 nations, including 15 core teams qualified for inclusion on all stops of the HSBC World Rugby Sevens Series. Teams will play a round-robin schedule of three games each within their pool on the Saturday. On Sunday, the top-8 teams will play a format that aligns with the Olympics, with teams will competing for Gold, Silver & Bronze medals. Teams accumulate points at each stop based on how they place, ultimately crowning a Series Champion at the end of each season. For more information on the HSBC World Rugby Sevens Series, click World Rugby Sevens Series. In and out privileges will be allowed until 3pm on each tournament day. If you exit after 3pm, you will not be permitted to re-enter the stadium. What are the accessibility options at BC Place? BC Place is where the whole province, and the world, comes together for the biggest and best events and exhibitions in BC. We’re committed to making sure that seniors, families, and people with disabilities have the best time possible. For more information, click BC Place Accessibility. Where is BC Place stadium located? BC Place stadium is located at 777 Pacific Blvd., Vancouver, BC, Canada V6B 4Y8. Can I ride my bike to the stadium? The friendly folk at The Bicycle Valet will be waiting to securely park your ride for FREE while you enjoy the event! Head to Gate C at BC Place to drop your bike off. What are the bag restrictions for this event? All bags are subject to search before entry to BC Place. All bags over 14x14x6 inches must be returned to your vehicle, hotel or residence. If that is not an option, a bag can be stored with the Bike Valet which is located at Gate C. Bag storage is open a half hour after the event. Are there any costume limitations? We encourage our fans to get creative with your #Sofancy7s costume ideas. Please be advised, masks are only to be worn in your seats. Masks cannot be worn on the concourse or common areas. Are animals allowed in BC Place stadium? With the exception of Pacific Assistance Dog Society (PADS) seeing-eye or hearing dogs, animals are not permitted in BC Place. First Aid Stations and rovers are located throughout the concourse on level 2. Please speak with staff if you or someone you know requires First Aid assistance. No. Please refer to the BC Place list of prohibited items found here: Prohibited Items . Personal photography is permitted in stadium, provided the images are for personal use only. Photographic support tools that may interfere with others’ enjoyment of the match (selfie sticks, tripods, professional lenses larger than 200 mm, etc.) are not permitted in the stadium. Will the stadium roof be open for the Canada Sevens tournament? If you have purchased your ticket through Ticketmaster.ca you can check the status of your order anytime by visiting My Ticketmaster account. Plus, you can print a receipt or your Print-at-Home tickets, customize your alerts, and more! If you bought tickets online, you already have an account – just sign in. If you bought tickets by phone, create a My Ticketmaster account now! If you need to talk to Ticketmaster staff, call them toll-free at 1-855-985-HELP (4357). My GA ticket has a different number next to it than my friend’s ticket. Can we still sit together? Yes! All GA tickets have the same stadium access regardless of the number on your ticket. Why does my GA ticket have a row/seat # on my ticket? GA tickets will have a section, seat and row associated to the ticket but this is for processing purposes. All GA tickets DO NOT have assigned seating. GA seating will be on a first come, first-served basis. Tickets will be sold on tournament days at all BC Place box offices, subject to availability. Spectators are encouraged to buy tickets ahead of time, as the tournament may sellout in advance of the event days. Ticket services will be open 1 hour prior to the first match kick-off. It is highly recommended that individuals purchase tickets prior to the event as tickets available on the day of the tournament are scarce. Is there special group pricing? Yes – groups of 10 or more receive a $10 discount on each tournament pass purchased. This offer is good for GA tickets only. Ticketmaster is limited to 20 tickets per transaction. How do I purchase more tickets? Groups looking to purchase 20+ tickets will either have to make multiple purchases online or can contact our ticketing representatives directly at tickets@canadasevens.com. As per BC Place’s operating procedure, one attendant ticket may be purchased with each wheelchair ticket and a seat will be provided for the guest’s attendant. Guests seated in GA seating are advised to arrive early on the day of the tournament and secure seating for additional members of their group behind the accessible platforms where the wheelchair and attendant seats are located. Guests seated in the 7s Access, 7s Reserved, or Club seats are advised to make their request known at the time of ticket purchase. Your ticketing agent will work with you to seat your group together, subject to availability at time of purchase. Children age two and under will be admitted free as long as the child is sitting on an adult’s lap. If a parent requires a physical seat for the child, he/she must purchase a ticket. Are there baby changing areas? Changing stations are located in washrooms throughout the stadium. There are also private Universal Washrooms available on Level 2. Can I bring my own food into the stadium? Outside food or drink is not permitted into the stadium. Special considerations will be made for infants (i.e. bottles and unopened baby food), and for medical reasons. Please contact BC Place by calling 604-669-2300 or stadium@bcpavco.com to make arrangements in advance. Any outside food or beverage will have to be consumed or disposed of at the gates. Empty water bottles are permitted into the stadium and are subject to search at the gate. Bottles can be filled at drinking fountains located on the main concourse. Bottled water can also be purchased in venue. Will there be breakfast options? Yes! BC Place will offer breakfast options during the 2018 tournament…including coffee! Applications for volunteers have now closed.